The All Systems Go! 2017 schedule has been published! I am happy to announce that we have published the All Systems Go! 2017 schedule! Here’s the schedule for the first day (Saturday, 21st of October). And here’s the schedule for the second day (Sunday, 22nd of October). 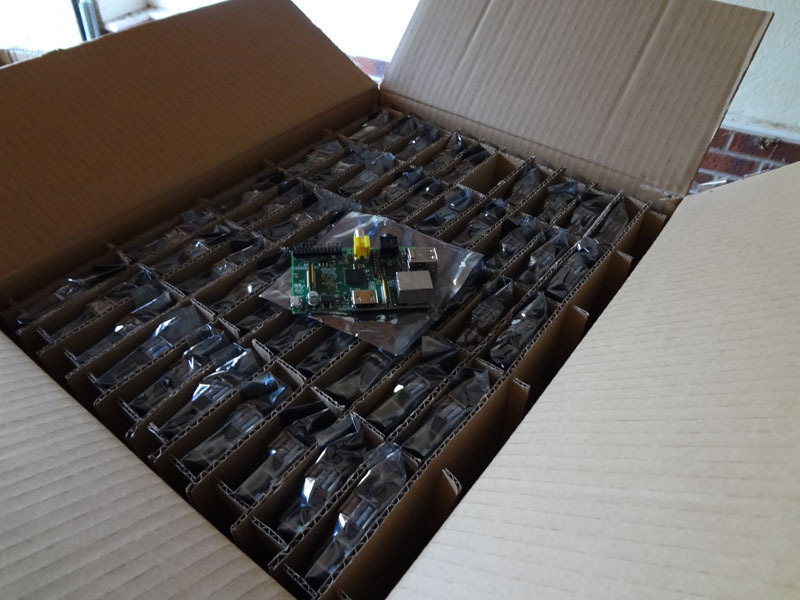 Pengutronix, Red Hat, SUSE and more. For further information about All Systems Go! visit our conference web site. before we are all sold out! Find all details here. 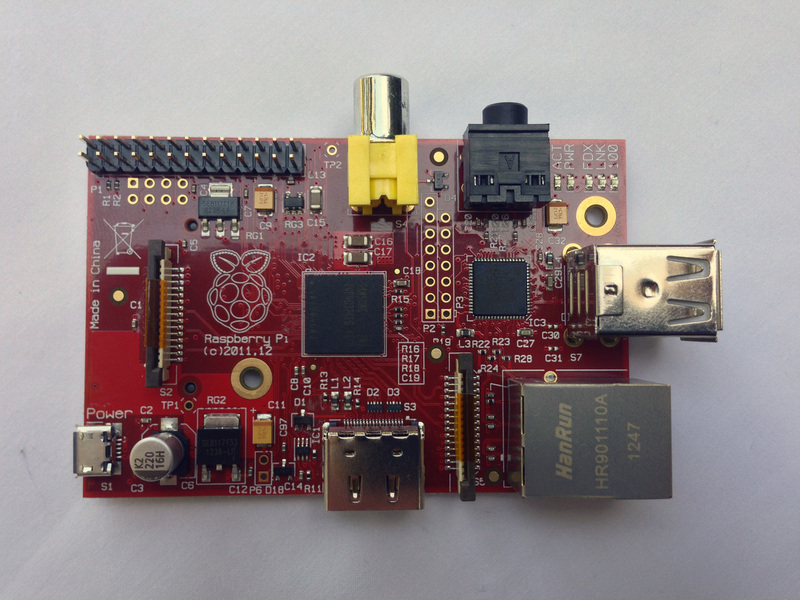 It’s now just under two years since we released the Jessie version of Raspbian. Those of you who know that Debian run their releases on a two-year cycle will therefore have been wondering when we might be releasing the next version, codenamed Stretch. 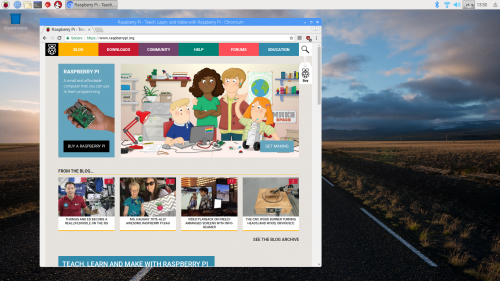 Well, wonder no longer – Raspbian Stretch is available for download today! Debian releases are named after characters from Disney Pixar’s Toy Story trilogy. 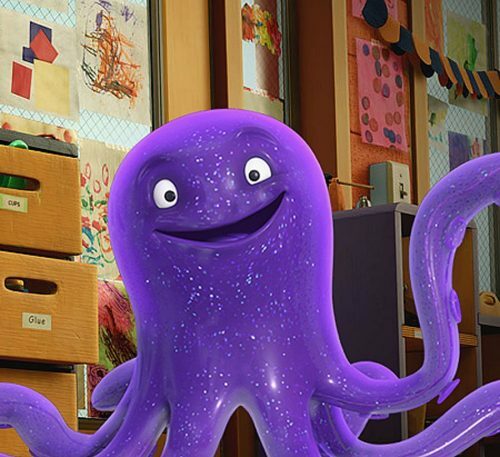 In case, like me, you were wondering: Stretch is a purple octopus from Toy Story 3. Hi, Stretch! However, we’ve made a few small changes to our image that are worth mentioning. 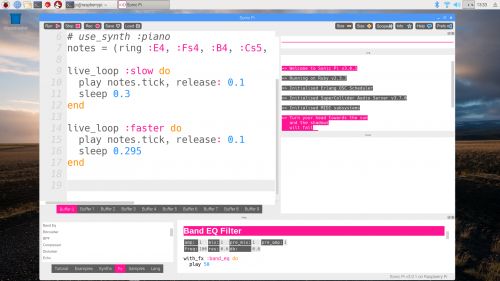 Version 3.0.1 of Sonic Pi is included – this includes a lot of new functionality in terms of input/output. See the Sonic Pi release notes for more details of exactly what has changed. The Chromium web browser has been updated to version 60, the most recent stable release. This offers improved memory usage and more efficient code, so you may notice it running slightly faster than before. The visual appearance has also been changed very slightly. In Jessie, we used PulseAudio to provide support for audio over Bluetooth, but integrating this with the ALSA architecture used for other audio sources was clumsy. For Stretch, we are using the bluez-alsa package to make Bluetooth audio work with ALSA itself. PulseAudio is therefore no longer installed by default, and the volume plugin on the taskbar will no longer start and stop PulseAudio. From a user point of view, everything should still work exactly as before – the only change is that if you still wish to use PulseAudio for some other reason, you will need to install it yourself. 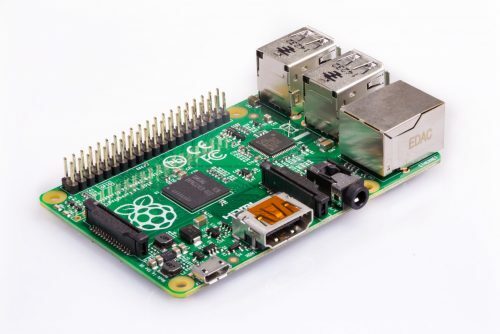 The default user account in Raspbian has always been called ‘pi’, and a lot of the desktop applications assume that this is the current user. 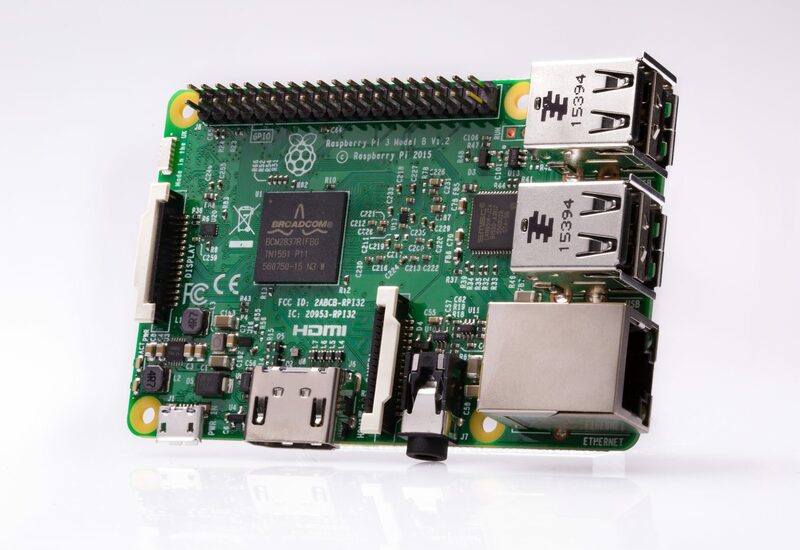 This has been changed for Stretch, so now applications like Raspberry Pi Configuration no longer assume this to be the case. This means, for example, that the option to automatically log in as the ‘pi’ user will now automatically log in with the name of the current user instead. One other change is how sudo is handled. 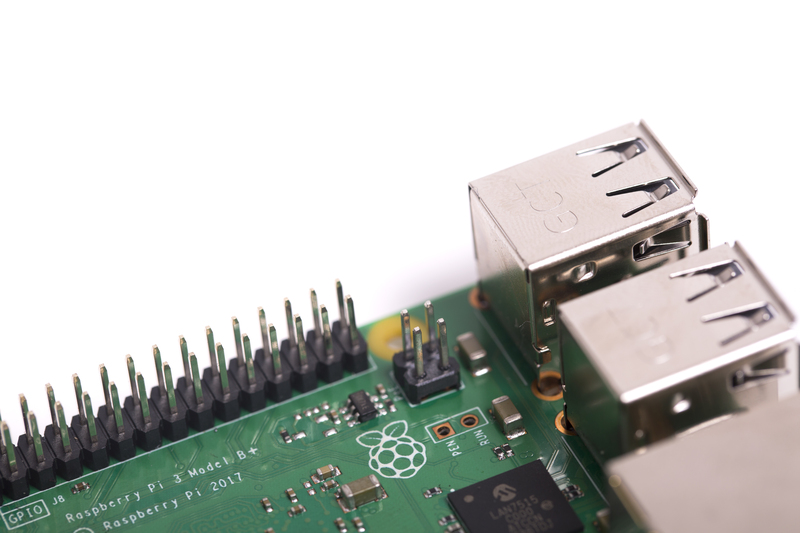 By default, the ‘pi’ user is set up with passwordless sudo access. We are no longer assuming this to be the case, so now desktop applications which require sudo access will prompt for the password rather than simply failing to work if a user without passwordless sudo uses them. 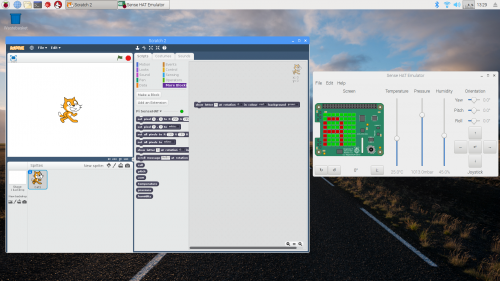 In the last Jessie release, we added the offline version of Scratch 2. 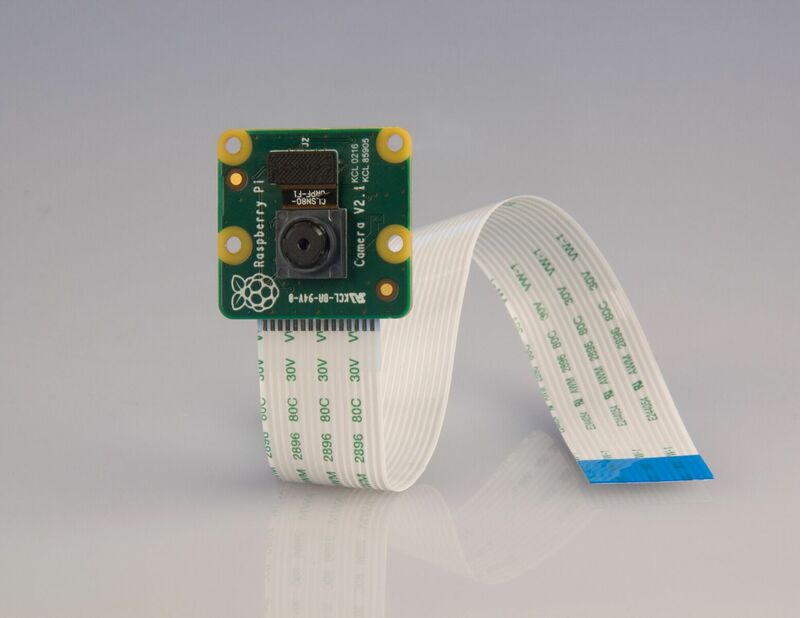 While Scratch 2 itself hasn’t changed for this release, we have added a new extension to allow the SenseHAT to be used with Scratch 2. Look under ‘More Blocks’ and choose ‘Add an Extension’ to load the extension. 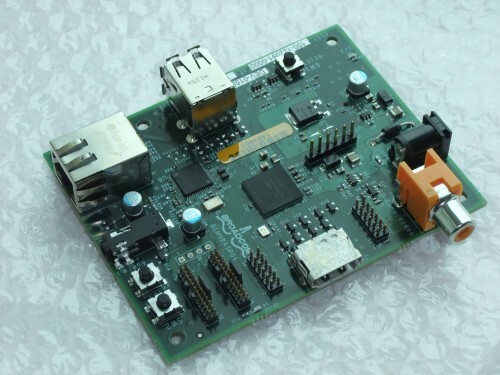 This works with either a physical SenseHAT or with the SenseHAT emulator. If a SenseHAT is connected, the extension will control that in preference to the emulator. 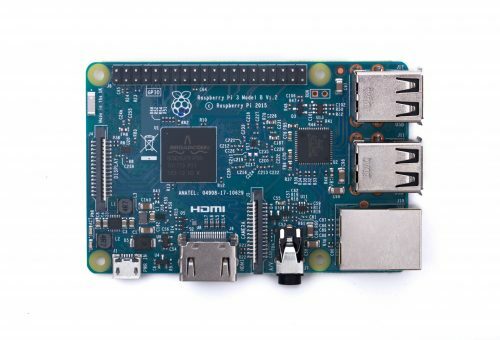 A couple of months ago, a vulnerability was discovered in the firmware of the BCM43xx wireless chipset which is used on Pi 3 and Pi Zero W; this potentially allows an attacker to take over the chip and execute code on it. The Stretch release includes a patch that addresses this vulnerability. There is also the usual set of minor bug fixes and UI improvements – I’ll leave you to spot those! Upgrading an existing Jessie image is possible, but is not guaranteed to work in every circumstance. If you wish to try upgrading a Jessie image to Stretch, we strongly recommend taking a backup first – we can accept no responsibility for loss of data from a failed update. Answer ‘yes’ to any prompts. There may also be a point at which the install pauses while a page of information is shown on the screen – hold the ‘space’ key to scroll through all of this and then hit ‘q’ to continue. 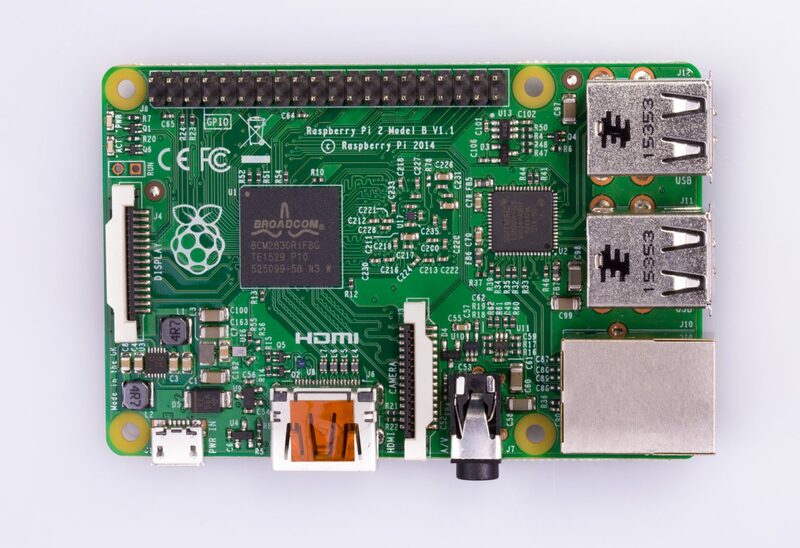 The post Raspbian Stretch has arrived for Raspberry Pi appeared first on Raspberry Pi. While analyzing the communication between the app and the Segway scooter itself, Kilbride noticed that a user PIN number meant to protect the Bluetooth communication from unauthorized access wasn’t being used for authentication at every level of the system. As a result, Kilbride could send arbitrary commands to the scooter without needing the user-chosen PIN. He also discovered that the hoverboard’s software update platform didn’t have a mechanism in place to confirm that firmware updates sent to the device were really from Segway (often called an “integrity check”). This meant that in addition to sending the scooter commands, an attacker could easily trick the device into installing a malicious firmware update that could override its fundamental programming. In this way an attacker would be able to nullify built-in safety mechanisms that prevented the app from remote-controlling or shutting off the vehicle while someone was on it. Hey everyone, Lucy here! 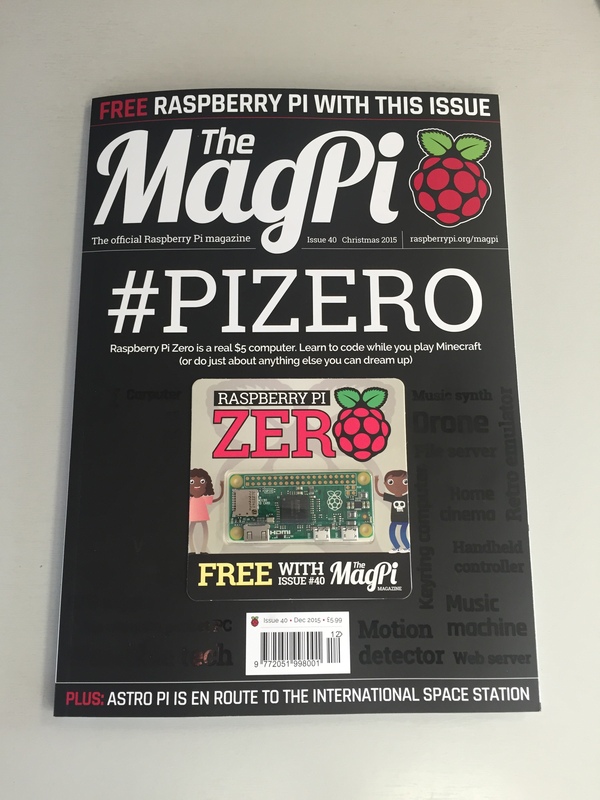 I’m standing in for Rob this month to introduce The MagPi 59, the latest edition of the official Raspberry Pi magazine. Ever wondered whether a Pi could truly replace your home computer? Looking for inspiration for a Pi-powered project you can make and use in the sunshine? Interested in winning a Raspberry Pi that’s a true collector’s item? Then we’ve got you covered in Issue 59, out in stores today! This month’s feature is fascinating! We set the legendary Rob Zwetsloot a challenge: use no other computer but a Raspberry Pi for a week, and let us know how it goes – for science! 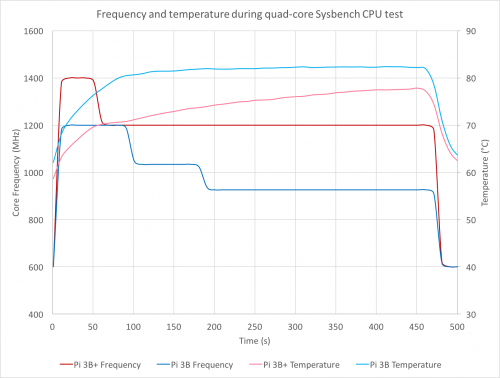 Is there anything you can’t do with a $35 computer? To find out, you just have to read the magazine. 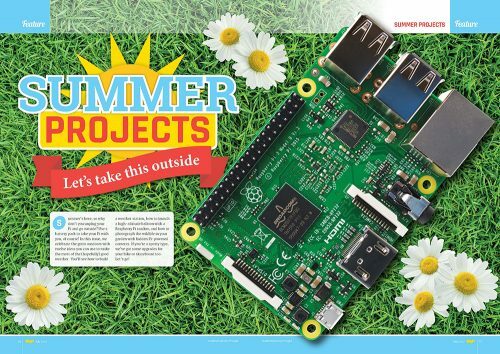 We’re bringing together some of the greatest outdoor projects for the Raspberry Pi in this MagPi issue. 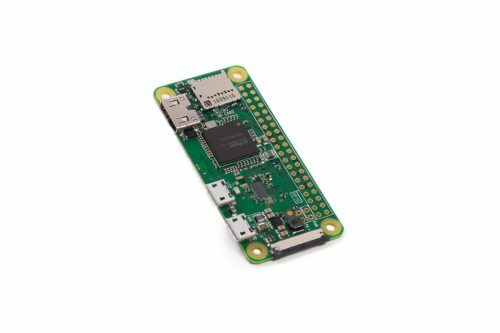 From a high-altitude balloon, to aerial photography, to bike computers and motorised skateboards, there’s plenty of bright ideas in The MagPi 59. 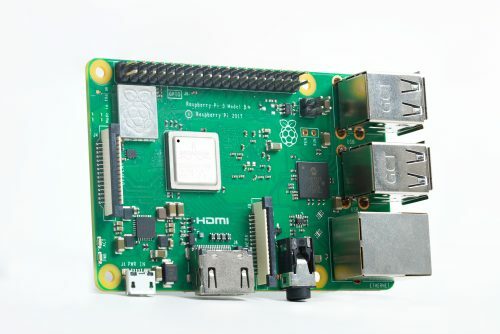 Maybe your Pi will ripen in the sun? We’ve got a fantastic collection of community projects this month. Ingmar Stapel shows off Big Rob, his SatNav-guided robot, while Eric Page demonstrates his Dog Treat Dispenser. 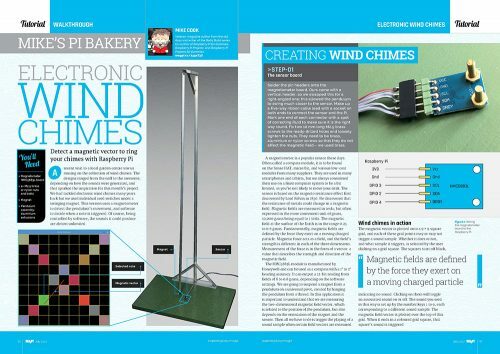 There are also interesting tutorials on building a GPS tracker, controlling a Raspberry Pi with an Android app and Bluetooth, and building an electronic wind chime with magnetometers. 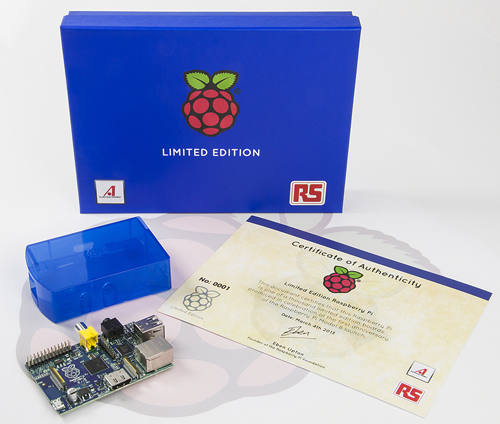 You can even enter our give-away of 10 ultra-rare ‘Raspberry Pi 3 plus official case’ kits signed by none other than Eben Upton, co-creator of the Raspberry Pi. 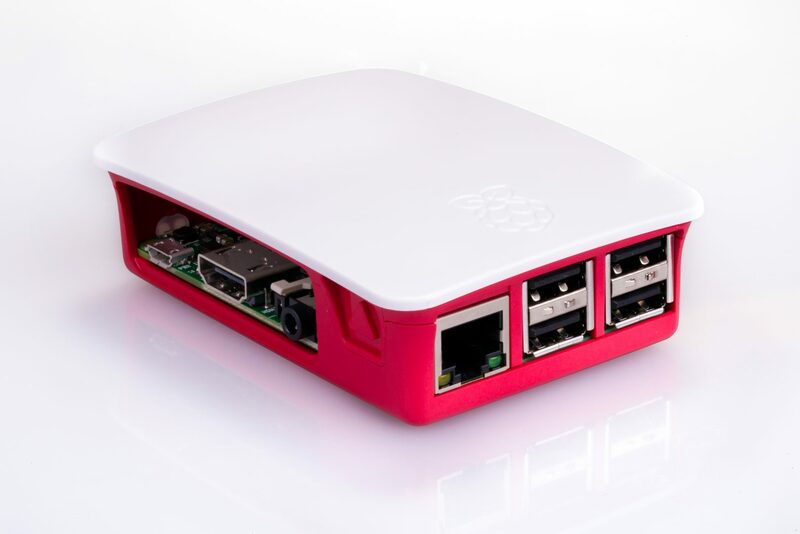 Win one and be the envy of the entire Raspberry Pi community! You can find The MagPi 59 in the UK right now, at WHSmith, Sainsbury’s, Asda, and Tesco. Copies will be arriving in US stores including Barnes & Noble and Micro Center very soon. You can also get a copy online from our store or via our Android or iOS app. And don’t forget: there’s always the free PDF as well. Get reading, get making, and enjoy the new issue! 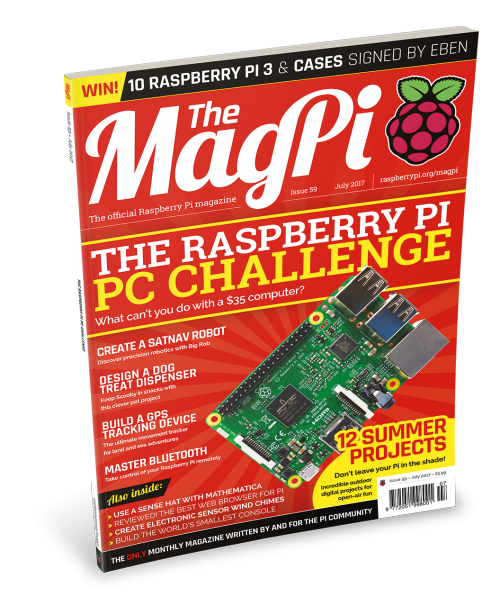 The post MagPi 59: the Raspberry Pi PC Challenge appeared first on Raspberry Pi. 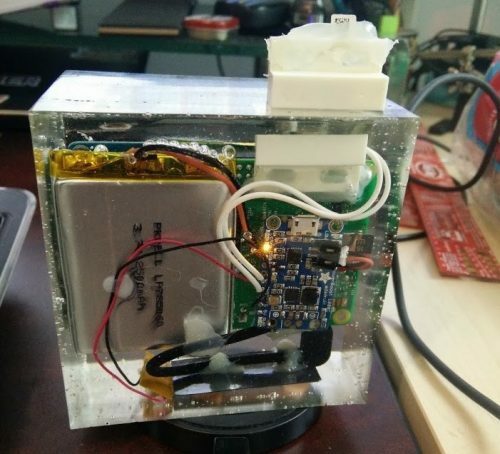 The maker of one of our favourite projects from this year’s Maker Faire Bay Area took the idea of an ’embedded device’ and ran with it: Ronald McCollam has created a wireless, completely epoxy-encased Pi build – screen included! 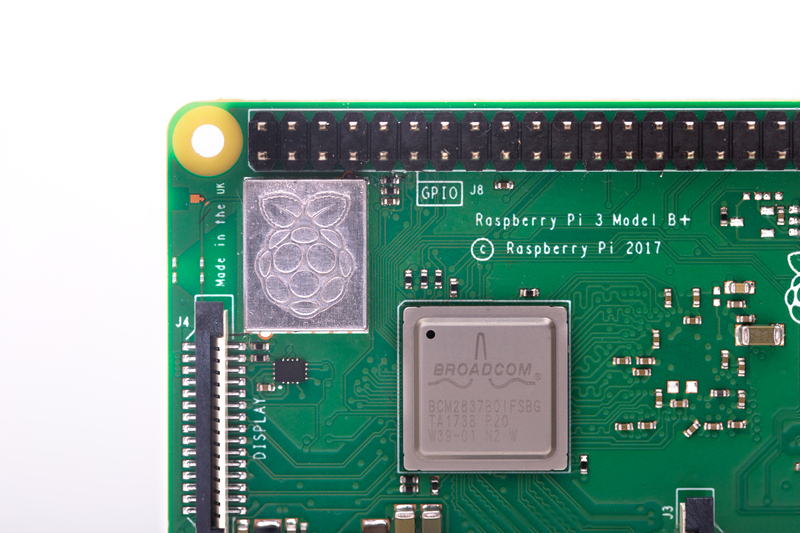 Of course, this build is not meant to be a museum piece: Ronald embedded a Raspberry Pi 3 with built-in wireless LAN and Bluetooth to create a hands-on demonstration of the resin.io platform, for which he is a Solution Architect. 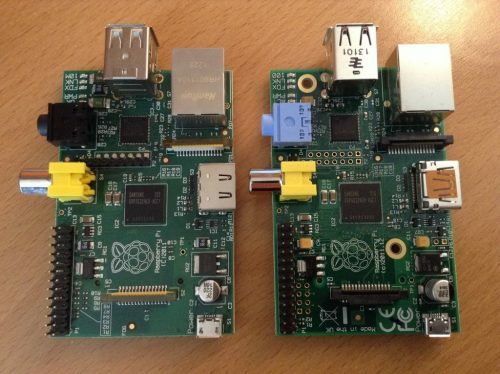 Resin.io is useful for remotely controlling groups of Linux-based IoT devices. In this case, Ronald used it to connect to the encased Pi. 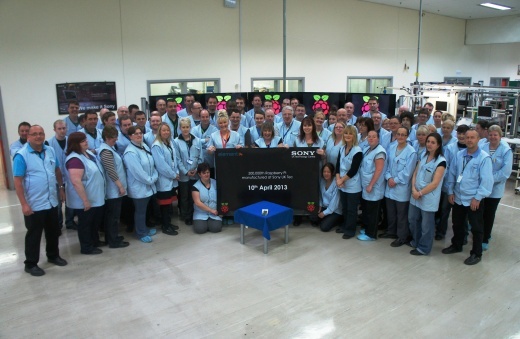 And yes, he named his make Resin-in-resin – we salute you, sir! Before he started the practical part of his project, he did his research to find a suitable resin. 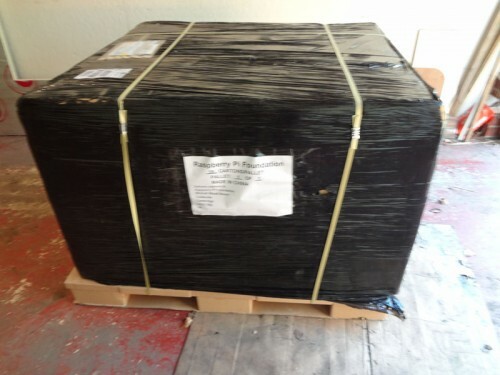 He found that epoxy types specifically designed for encasing electronics are very expensive. In the end, Ronald tried out a cheap type, usually employed to coat furniture, by encasing an LED. 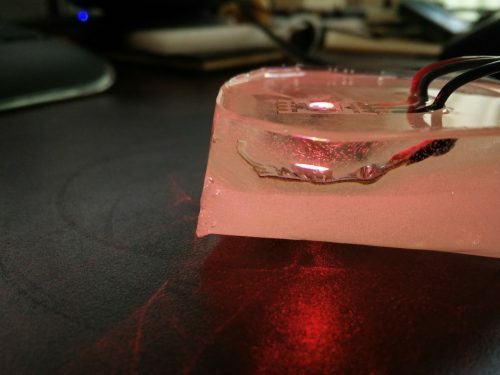 It worked perfectly, and he went ahead to use this resin for embedding the Pi. This was the first time Ronald had worked with resin, so he learned some essential things about casting. He advises other makers to mix the epoxy very, very slowly to minimize the formation of bubbles; to try their hands on some small-scale casting attempts first; and to make sure they’re using a large enough mold for casting. 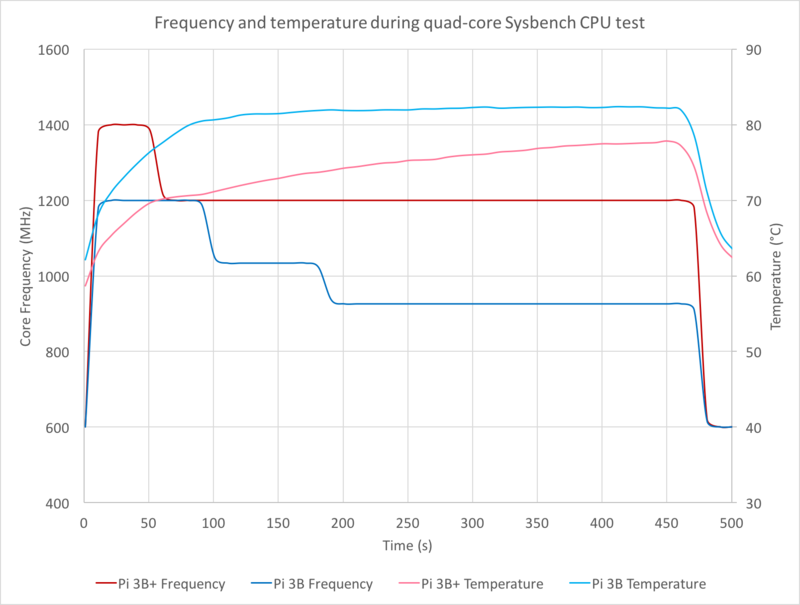 Another thing to keep in mind is that some components of the make will heat up and expand while the device is running. 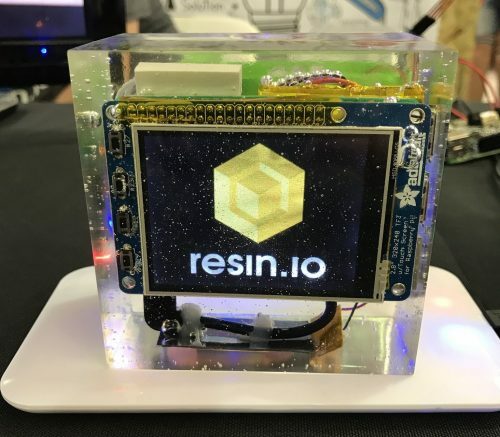 Updates don’t get more “hands off” than a Raspberry Pi encased in epoxy — @resin_io inside resin! Come ask me about it at @DockerCon! 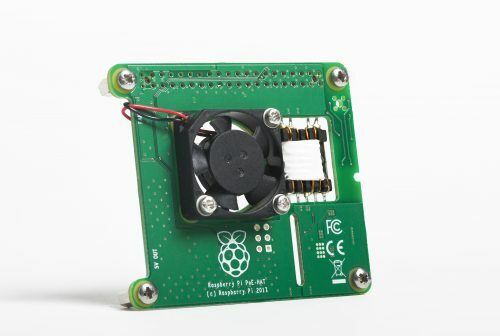 [The] boot process is to use the magnetic switch to turn off the Pi, put it on the charger for a few minutes to allow the battery to charge up, then remove the magnet so the Pi boots. 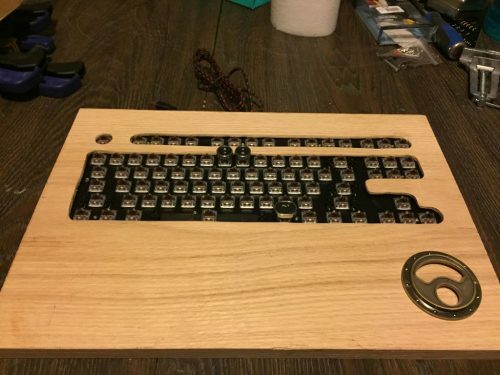 He talks about his build on the resin.io blog, and has provided a detailed project log on Hackaday. 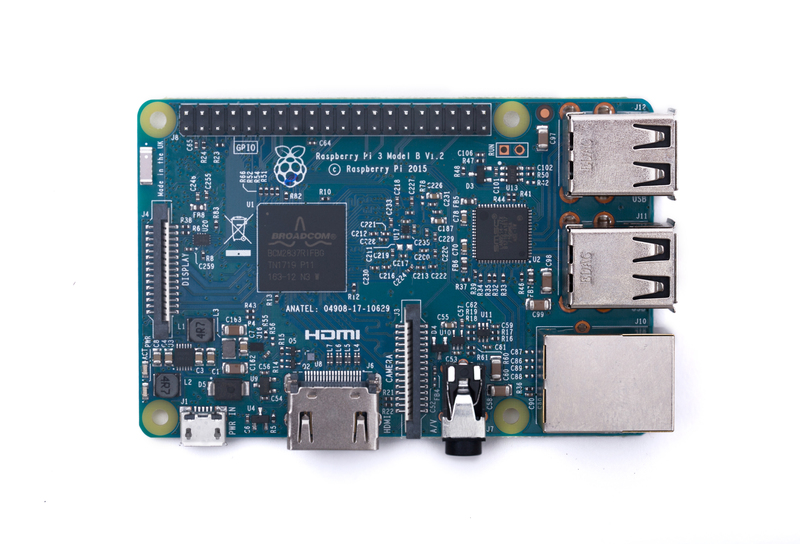 For those of you who want to recreate this project at home, Ronald has even put together an Adafruit wishlist of the necessary components. Does this resin-ate with you? 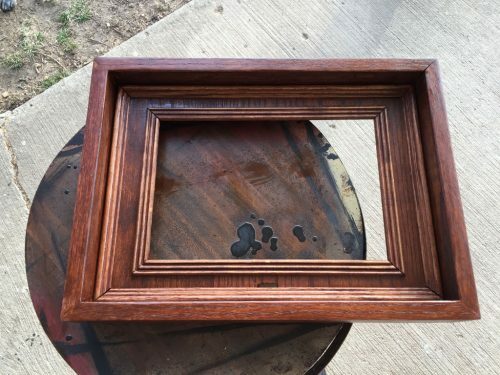 What’s especially great about Ronald’s posts is that they’re full of helpful tips about getting started with using epoxy resin in your digital making projects. 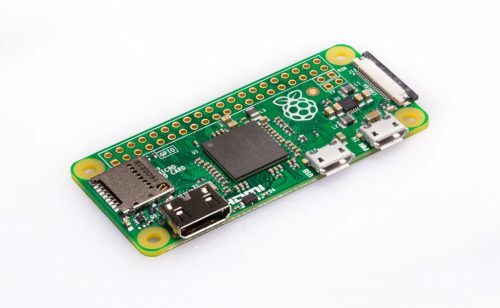 So whether you’re keen to build your own wireless Pi, or just generally interested in embedding electronic components in resin, you’ll find his write-ups useful. If you have experience in working with epoxy and electronic devices and want to share what you’ve learned, please do so in the comments! The post Encased in amber: meet the epoxy-embedded Pi appeared first on Raspberry Pi. At primary school, I loved my Tamagotchi: it moved, it beeped, it was almost like I could talk to it! Nowadays, kids can actually have conversations with their toys, and some toys are IoT devices, capable of accessing online services or of interacting with people via the Internet. 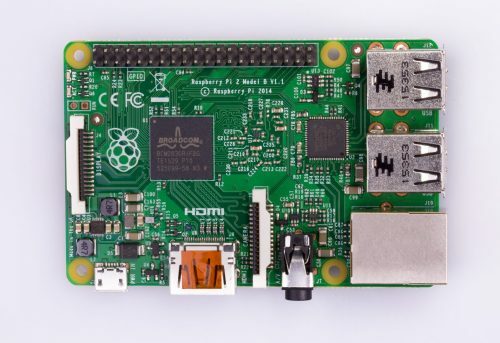 And so to one of this week’s news stories: using a Raspberry Pi, an eleven-year-old has demonstrated how to weaponise a teddy bear. 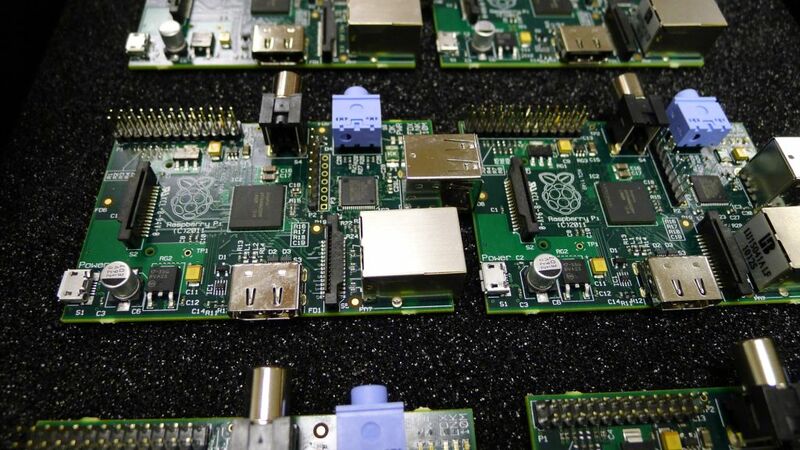 This has garnered lots of attention, because he did it at a cybersecurity conference in The Hague, and he used the Bluetooth devices of the assembled experts to do it. Reuben has quite of bit of digital making experience, and he’s very concerned about the safety risks of IoT devices. “IoT home appliances, things that can be used in our everyday lives, our cars, lights, refrigerators, everything like this that is connected can be used and weaponised to spy on us or harm us,” he told AFP. 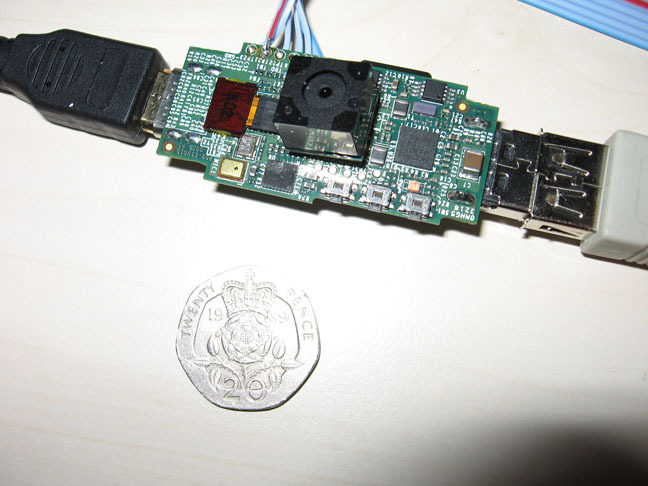 Apparently even his father, software security expert Mano Paul, was unaware of just how unsafe IoT toys can be until Reuben “shocked” him by hacking a toy car. Reuben is using his computer skills for good: he has already founded an organisation to educate children and adults about cybersecurity. Considering that he is also the youngest Shaolin Kung Fu black belt in the US and reportedly has excellent gymnastics skills, I’m getting serious superhero vibes from this kid! The post Weaponising a teddy bear appeared first on Raspberry Pi. 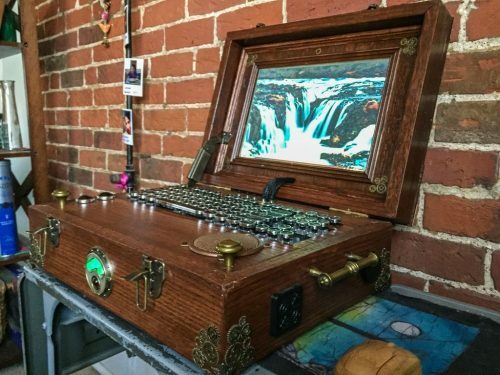 In this digital age, where backup computers and multiple internet-connected devices are a must, maker phrazelle built this beautiful Raspberry Pi-powered steampunk laptop for his girlfriend. And now we all want one. I mean, just look at it! There’s no denying that, had Liz seen this before me, she’d have copied the link into an email and titled it INSTABLOG before sending it to my inbox. This build is gorgeous. 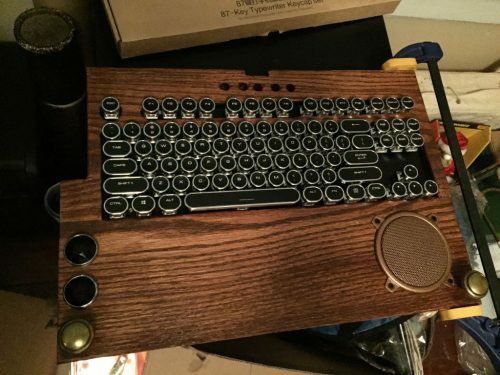 And as a fan of quirky-looking tech builds and of making things out of wood, it caught my eye in a heartbeat, causing me to exclaim “Why, I – ugh! – I want a Steampunk laptop? !” Shortly afterwards, there followed the realisation that there is an Instructables page for the project, leading me to rejoice that I could make my own. “You’ll never finish it,” chides the incomplete Magic Mirror beneath my desk. I shush it with a kick. Originally wanting a hole for each key, phrazelle used a paint relief method to mark the place of each one. However, this didn’t work out too well, so he decided to jigsaw out a general space for the keys in a group. After a few attempts and an application of Gorilla Glue, it was looking good. With his father’s help, phrazelle’s next step was to build the box for the body of the laptop. Again, it was something of an unplanned mashup, resulting in a box that was built around the keyboard tray. 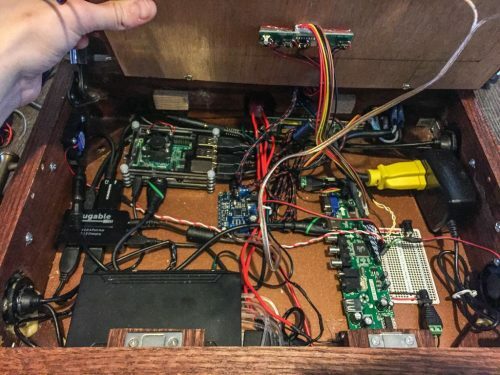 Via a series of mitred joints, routing, and some last minute trim, he was able to fit an LCD screen from a cannibalised laptop into the lid, complete with an LCD driver acquired from eBay. “As I was going in the Steampunk direction, gears and gauges seemed to make sense,” says phrazelle. “I found a lot of cool stuff on Etsy and Amazon. The front battery gauge, back switch plate, and LED indicator housings came off Etsy.” He also discovered that actual watch gears, which he had purchased in bulk, were too flimsy for use as decoration, so he replaced them with some brass replicas from Amazon instead. Hand-blown marbles worked as LED defusers and the case was complete. Within the laptop body, phrazelle (do let us know your actual name, by the way) included a Talentcell battery pack which he modified to cut the output lines, something that was causing grief when trying to charge the battery. 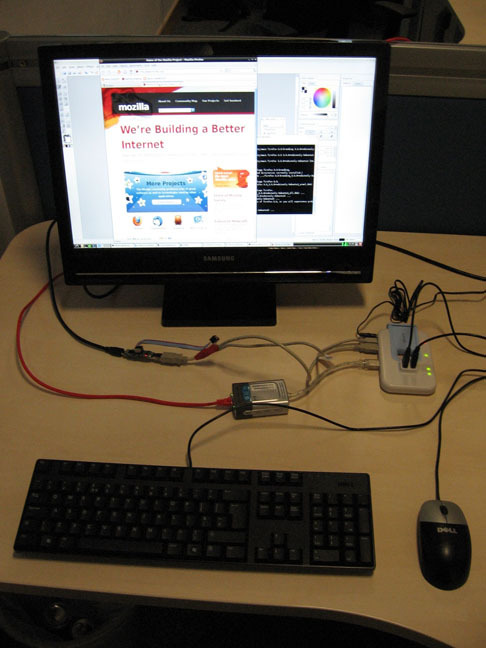 He utilised a plugable USB 2.4 four-port powered hub to power the Raspberry Pi and optional USB devices. He also added a bushel of various other modifications, all of which he explains on his Instructables page. This thing runs like a champ! For its intended functionality, it does everything it needs to. You can get on the internet, write papers, check email… If you want to get nerdy, you can even brush up on your coding skillz. As I said, we love this build. Not only is it a great example of creating an all-in-one Raspberry Pi laptop, but it’s also gorgeous! Make sure to check out phrazelle’s other builds on Instructables, including his Zelda-themed bartop arcade and his ornate magic mirror. 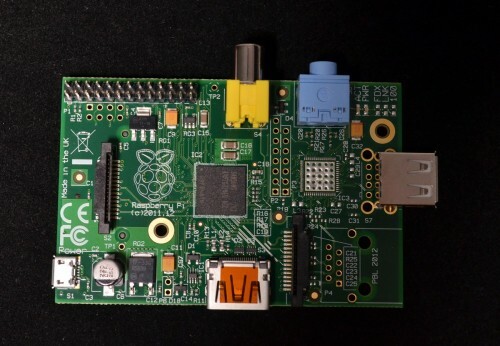 Have you built your own Pi laptop? Tell us about it in the comments below. We can’t wait to see it! 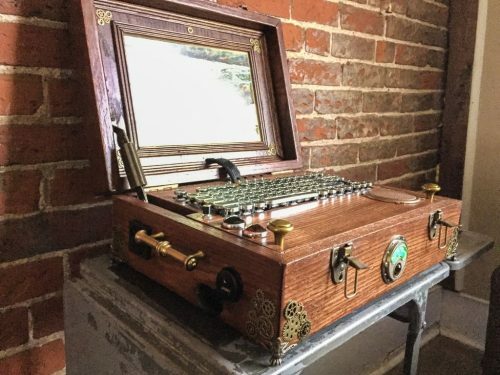 The post Steampunk laptop powered by Pi: OMG so fancy! appeared first on Raspberry Pi.